Download for help to determine your requirements for selecting the proper equipment! CMAA has organized this Buyer's Guide to promote standardization and to assist prospective buyer's of electric overhead traveling cranes in selection of equipment most suitable for their applications. The Crane Manufacturers Association of America, known as CMAA, is an organization of over thirty leading American manufacturers of electric overhead traveling cranes and components. CMAA has published standardized crane specifications for almost sixty years. Two publications in particular, CMAA 70 - Specifications for Top Running Bridge & Gantry Type Multiple Girder Electric Overhead Traveling Cranes and CMAA 74 - Specifications for Top Running & Under Running Single Girder Electric Traveling Cranes Utilizing Under Running Trolley Hoist, are recognized throughout the United States as the de facto standards of industrial crane design. CMAA traces its roots to the Electric Overhead Crane Institute, known as EOCI, which was founded in 1927 by leading crane manufacturers of that time to promote standardization of cranes, uniform quality and performance. EOCI published standardized specifications in 1949 and again in 1961. CMAA Specification 70, first published in 1971, superseded ECOI 61. Since 1971, CMAA Specification 70 has been republished several times with changes and updates managed by CMAA's Engineering Committee. 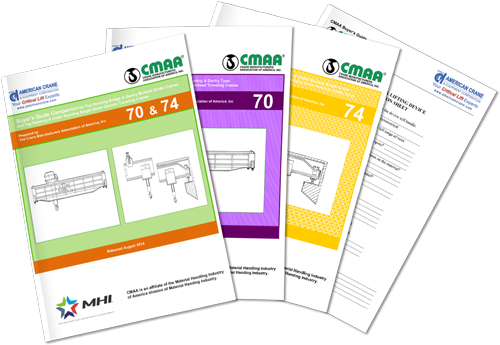 CMAA Specification 74 was first published in 1974 to provide similar design information on single girder cranes. CMAA traces its roots to the Electric Overhead Crane Institute, known as EOCI, which was founded in 1927 by leading crane manufacturers of that time to promote standardization of cranes, uniform quality and performance. EOCI published standardized specifications in 1949 and again in 1961.CMAA Specification 70, first published in 1971, superseded ECOI 61. 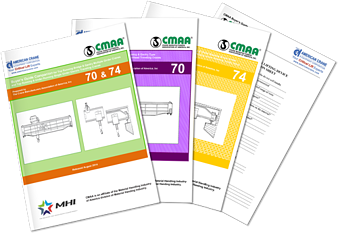 Since 1971, CMAA Specification 70 has been republished several times with changes and updates managed by CMAA's Engineering Committee. CMAA Specification 74 was first published in 1974 to provide similar design information on single girder cranes.CMAA has organized this Buyer's Guide to promote standardization and to assist prospective buyer's of electric overhead traveling cranes in selection of equipment most suitable for their applications. The Crane Manufacturers Association of America, known as CMAA, is an organization of over thirty leading American manufacturers of electric overhead traveling cranes and components.